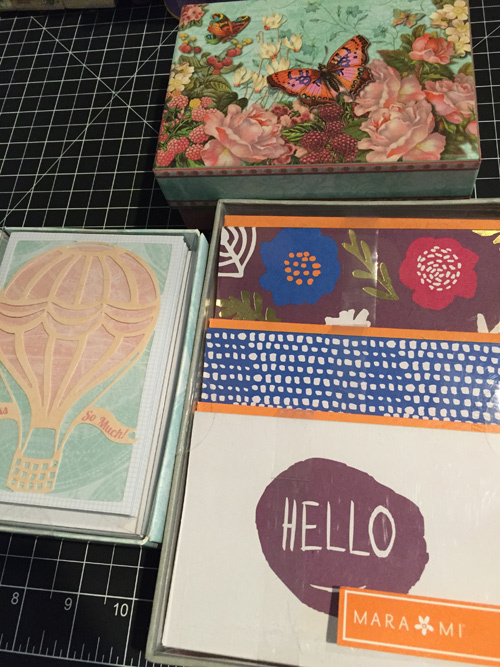 At first I thought of making all of my cards for this WriteOn challenge and then I realized it would be cutting too far into my work schedule so I ran out to find some cute cards to use to write my 30 letters. I found all these beauties at TJ Maxx. I have always looked at the card selections there because they get really great brands and sell them at a really good price. 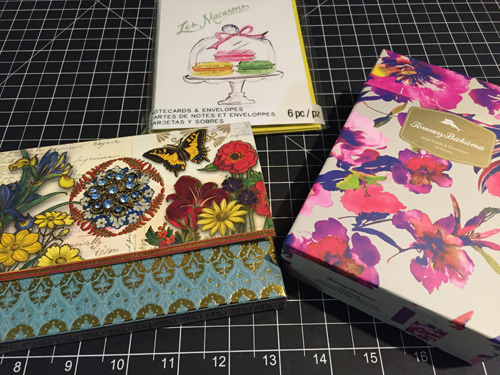 I even think I will use the clever box designs and try to recreate them with my Silhouette. I am always looking for the challenge. The butterfly one on the left even has a magnetic closure which I will definitely be incorporating into a future project. I began writing a list of potential recipients and will check them off as I mail them a letter. I am sad to say that I don’t buy books of stamps as often as I would like. Despite my complaints that I don’t want Post Offices closing, while preparing for this challenge I realize that I don’t do enough to ensure that doesn’t happen. And that means using their services more regularly and buying more stamps. I can’t imagine not having post offices anymore than I can seeing our libraries disappear. So this challenge will help me put action to my beliefs. 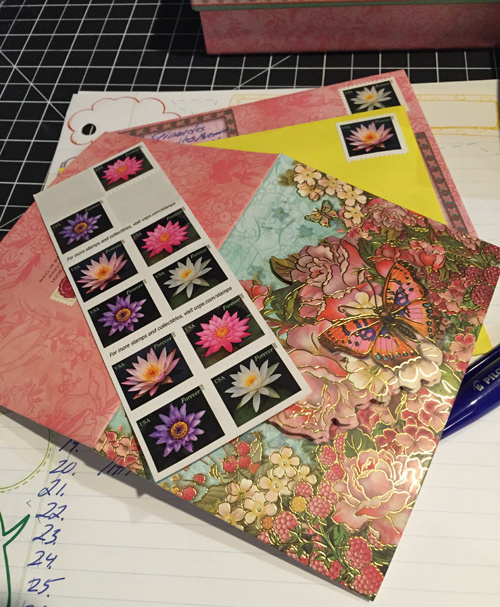 I found these lovely floral stamps and they are almost too pretty to mail (there goes that hoarder talking)! 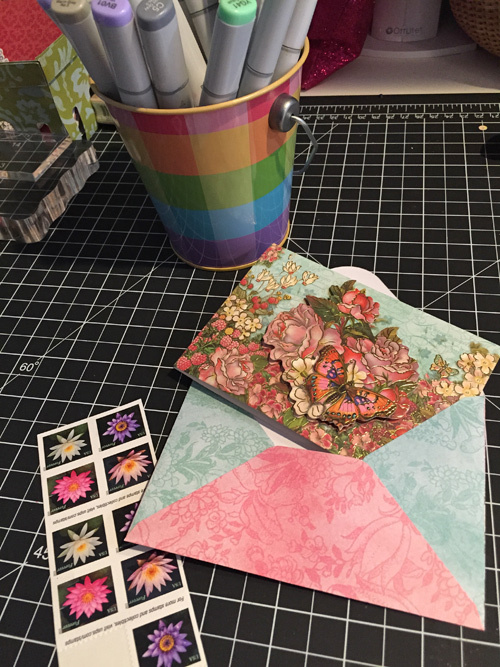 I love this card because the flowers are dimensional and the envelope is in pretty colors too. I sat and began writing and let me tell you, I don’t write as much and for very long when I do so I am embarrassed to say, that my hand actually began aching. However, I pushed on and wrote two letters. Apollo even joined in and mailed his first letter for the month. Today I will write another. I am liking that the recipients won’t be expecting anything from me so that makes it more special. I hope you find a time to send a letter to someone this month. Think how happy they will be to receive it and it only costs you the price of a postage stamp. 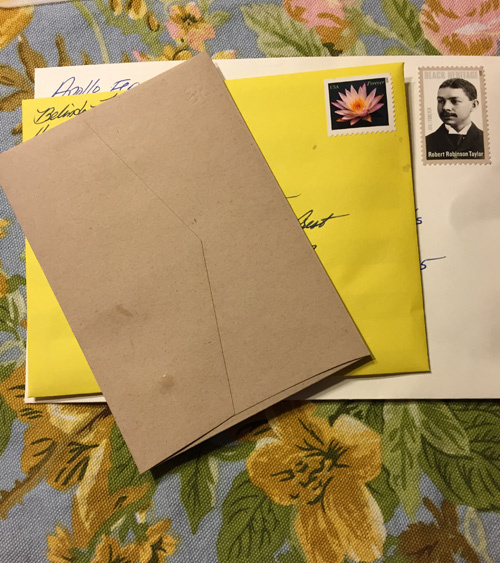 You are so cute… and I love this project… I used to be so good about sending mail to people. So… today when I was at the post office to mail our not so fun annual mail, I got stamps that I may have to share. They rock! Like you, I always go for flowers, loved the farmers market of recent, but these are so fun everyone should send mail! Thanks Ashley. I can’t wait to see what book of stamps you bought. My post office has a limited selection right now. Makes me want to snoop to neighboring towns and see what their selling!! You know, I just might do that. The next thing I need to work on my handwriting. I was in the computer industry for many years before the boys so writing with my hands was not really needed much. So I look at my handwriting and cringe. What happened? Well I hope you resume writing again because it’s how we will impact this technology crazed society in a good way.